NORTH VANCOUVER, October 22,2014 — The City of North Vancouver and Hollyburn Properties are celebrating the groundbreaking of Bridgewater—the municipality’s first purpose-built rental high-rise building in decades. The history behind the new development involves a land trade between the two stakeholders in 2005 that enabled both the Bridgewater project as well as the establishment of the City of North Vancouver’s adjacent Civic Plaza. 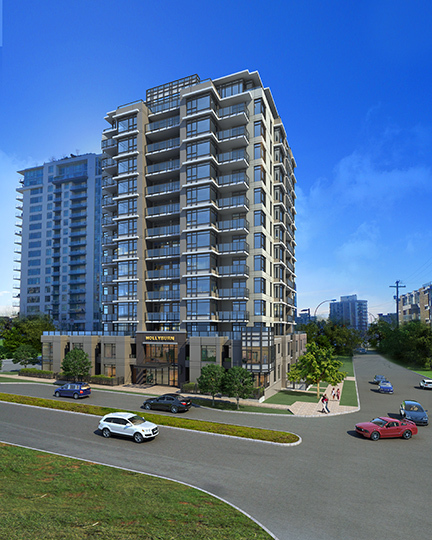 The Bridgewater rental building, Hollyburn’s first venture in new construction development, will provide an accessible housing alternative to the Central Lonsdale community and fill the current gap of modern rental housing options in the area, furthering the revitalization of Central Lonsdale and the Civic Plaza. Offering 14 floors,Bridgewater will provide 130 stunning rental suites, from studios to townhouses. M2 is a responsible green development, boasting an industry-leading rooftop garden and common area as well as spectacular views, live-in management, and access to the heart of the community civic plaza and North Vancouver’s surrounding natural beauty. Rents will start at $1100 per month. The groundbreaking event will feature an address by the founder of Hollyburn Properties, entrepreneur Mr. Stephen Sander and guest, Mayor Darrell Mussatto. Hollyburn and the North Vancouver City Library, will launch a series of seasonal bookmark colouring contests, with public artwork to be featured on Bridgewater site signage throughout the duration of the project. “The City is pleased to welcome Hollyburn’s rental apartment building project to the heart of Central Lonsdale where the City Library, Civic Plaza, City Hall, and so many wonderful local amenities will provide the residents of Bridgewater with community ambience, convenience and a liveable and engaged neighbourhood,” says Mayor Darrell Mussatto. Bridgewater begins construction in November, 2014, with move in’s anticipated Summer 2016. The public is encouraged to keep in touch, and to watch the progress of the Bridgewater high-rise rental building throughout this groundbreaking journey! For more information, please visit our website. WHEN: 11:30 a.m. – 12:30 p.m.
Hollyburn Properties Limited is one of Vancouver’s longest-standing Canadian-owned and operated property management companies. Established 40 years ago, Hollyburn is a family-run business at the forefront of the property management industry, dedicated to providing the finest rental apartment homes in three provinces across Canada. Hollyburn currently manages and operates 75 rental communities nationwide, with 5,000 suites in Vancouver, Calgary, Toronto and Ottawa. Through environmental stewardship, employee training and support and community partnerships, it is Hollyburn’s mission to raise the standard of their property management practices to the benefit of their residents, their employees and the property management industry in Canada.